Tim Pitsiulak has been drawn to the arts and various forms of artistic expression for many years. He started to draw as a young boy and later took up carving as well. He has also participated in jewellerymaking workshops offered in Iqaluit. 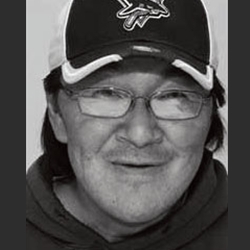 Born in Kimmirut (Lake Harbour) in 1967 to Napachie (deceased) and Timila Pitsiulak, Tim has been living in Cape Dorset for several years now and has enjoyed working in the lithography studio with visiting arts advisor, Bill Ritchie. The land and its wildlife were initially the primary influences on Tim’s realist drawing style. More recently he has become a chronicler of the everyday, drawing large format, meticulously detailed depictions of boats, heavy equipment and airplanes – the machinery of modern life in Cape Dorset. Tim also incorporates Inuit cultural heritage into his work, represented here by a prehistoric mask (Kiinappak, 2011-33). Deceptive in its simplicity, the intense spirit of the shaman emanates through. In direct contrast, the sea goddess Sedna shows off her smooth, untangled hair, indicating her contentment with the world around her and state of repose (Sedna’s Repose, 2011-32).